Yes, the leaves are changing and the days are getting shorter. Winter will be here soon. But before it arrives, there’s time to squeeze in another adventure. One of the best ways to soak in all that fall has to offer is by hiking in the Great Smoky Mountains National Park. For many in the South, trekking through the Smokies is an easy weekend getaway. Because of its proximity to the park, dining options, and overnight accommodations, Gatlinburg, in eastern Tennessee, is often home base for those exploring the park. Be sure to check the weather before hitting the trail. Get an early start and expect to spend the entire day in the forest. To make the hike more comfortable, dress in layers and bring plenty of snacks and water. And, just in case, bear spray. Before or after your hike be sure to check out some of the best food and drink options in Gatlinburg. Try the Mountain Lodge for breakfast. It will keep you fueled up for a day in the woods. For barbecue, Delauder’s might be the best in town. And visit the Ship Pub for a post-hike drink. The Smokies’ fall color season peaks around mid-October through early November. Listed below are five fall hikes, plus a couple more, that showcase the fiery fall displays in the park and the surrounding area. From mature hardwood forests to craggy outcroppings, the views from these trails are stunning. Fall is here. To get the most out of the season, get outfitted with The North Face’s latest gear available at local retailer NOC Gatlinburg. Then head out and make the most out of every second of daylight. From the shelter of Alum Cave, one can see Mount LeConte. Photo by Frances Davis. 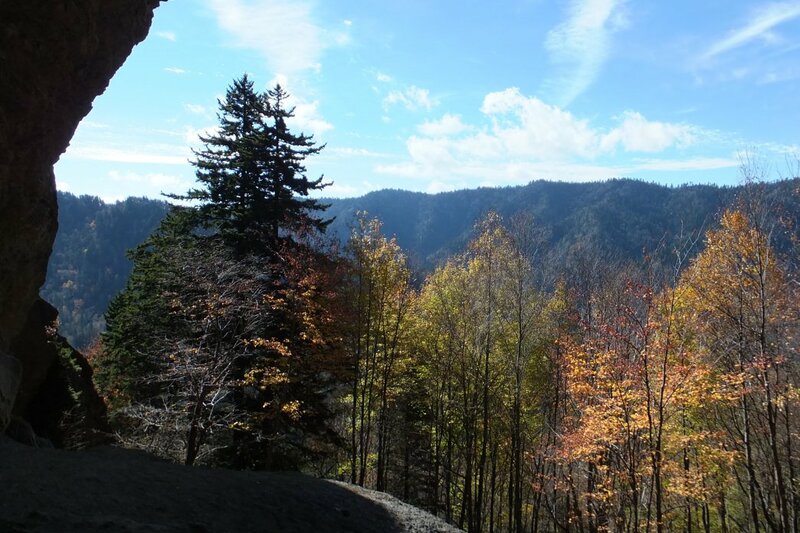 Take Alum Cave Trail to the summit of Mount LeConte for some of the most interesting geology, history, and stunning views in the Great Smoky Mountains National Park. Hike highlights include the carved stone steps of Arch Rock, stunning views of Inspiration Point, and Alum Cave, where the Epsom Salt Company was established in 1838 and Confederate troops mined saltpeter to make gunpowder. Don’t end your hike at the lodge. Continue another half mile to the summit. It’s worth the extra effort. Keep in mind the trail is closed for maintenance during the week. It is only open on the weekends currently. 8.7 miles south of Sugarlands Visitor Center on Newfound Gap Road. Parking lot is on the left. The sun sets over Andrews Bald, the summit of which can be reached on the Appalachian Trail. Photo by Stewart Photography. Andrews Bald is accessible from the Forney Ridge Trail located in the Clingmans Dome parking lot, the highest elevation in the park. The hike begins with a descent though the remains of a spruce-fir forest, then briefly connects with the Appalachian Trail before arriving at Andrews Bald. This high-elevation, grassy meadow offers panoramic views of the wrinkled mountains below. 13.2 miles south of Sugarlands Visitor Center on Newfound Gap Road. Turn right on Clingmans Dome Road. Then seven miles to parking area. The building at the summit of Mt. Cammerer provides a 360-degree view of the surrounding mountains. Photo by Kripptic. The first three miles of this intense climb up the Low Gap Trail will elevate hikers more than 2,000 feet through mature forest and across several switchbacks before joining the Appalachian Trail. From there take a left toward the Mount Cammerer Trail. Near the five-mile mark you’ll find a spur trail leading to the summit--a rocky outcrop overlooking Pigeon River Gorge. The summit features a stone fire lookout with a 360-degree view of the surrounding mountains. At the third light in Gatlinburg (junction of Highways 441 and 321), take Highway 321 east for 18.2 miles. Turn right on Highway 32 and drive 1.2 miles to the park entrance. Take a right and drive 2.1 miles to the Low Gap Trailhead near Cosby Campground. The North Carolina Smokies can be glimpsed through the trees en route to the the top of Charlies Bunion. Photo by Shannon McGee. The first two miles are a steady climb from the Newfound Gap parking lot. On the way up hikers are treated to excellent views of the North Carolina Smokies. Near the two-mile mark, Mount LeConte and Myrtle Point come into view. At about four miles take the spur trail on the left to Charlies Bunion, a rocky outcrop with sheer drop-offs. Mount Kephart is to the north and Mount Guyot to the east. 13 miles south of Sugarlands Visitor Center on Newfound Gap Road. The Jump Off Trail takes hikers to views above the clouds. Photo by Shannon McGee. As a side trail off the Charlies Bunion Trail, the Jump Off shares most of the same stunning views. To reach the Jump Off, follow the sign just after joining the Boulevard Trail about three miles in from the trailhead. The Jump Off offers excellent views of the nearby Charlies Bunion outcrop, Mount Guyot, and Appalachian Trail ridge. While not as visually dramatic as the hikes listed above, Curry Mountain is also worth exploring. This underutilized 6.4-mile trail offers plenty of solitude, which can be a relief during the busy fall hiking season. The trailhead is located about 100 yards away from the Metcalf Bottoms Picnic Area. For an additional hike outside of the Smokies, try the Chimney Rocks Paint Mountain Loop in the Cherokee National Forest. This 6.4-mile trail offers serene views of Weaver’s Bend and the French Broad River. Unlike in the national park, the Paint Mountain Loop is dog friendly. This story brought to you by The North Face. Originally written by RootsRated for NOC Gatlinburg.